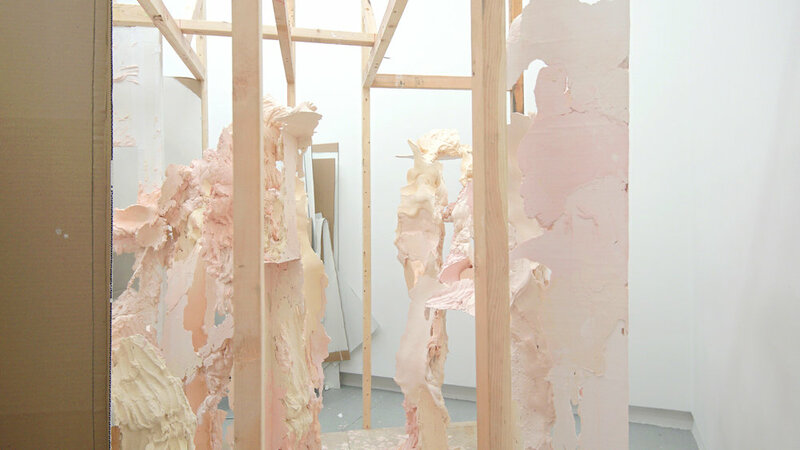 SHEE is a process-based and performative sculpture produced in situ during the first month of UNTIL DIFFERENT at Arsenal Contemporary, New York. Inside a painted card and wood 3/4 scale replica of its eponymous space habitat. SHEE, the habitat was designed by architect Barbara Imhof’s consortium – Liquifer – as a European Space Agency commission. The Self-deploying Habitat for Extreme Environments deploys into a 300sq ft space that is able to sustain life in otherwise inhospitable environments such as the surface of Mars or the site of a nuclear disaster. It was reproduced in Arsenal Contemporary in its un-deployed state, when the interior architecture is folded, compressed and stacked leaving sinuous negative spaces within the habitat. The 14.5 (long) x 5.9 (wide) x 6.9ft (tall) replica was situated at the back space of the gallery and fully rendered at the opening of the exhibition. During the first month of the show, when the gallery was closed, this structure was slowly ‘eaten’ from back to front as I produced the sculpture in private. 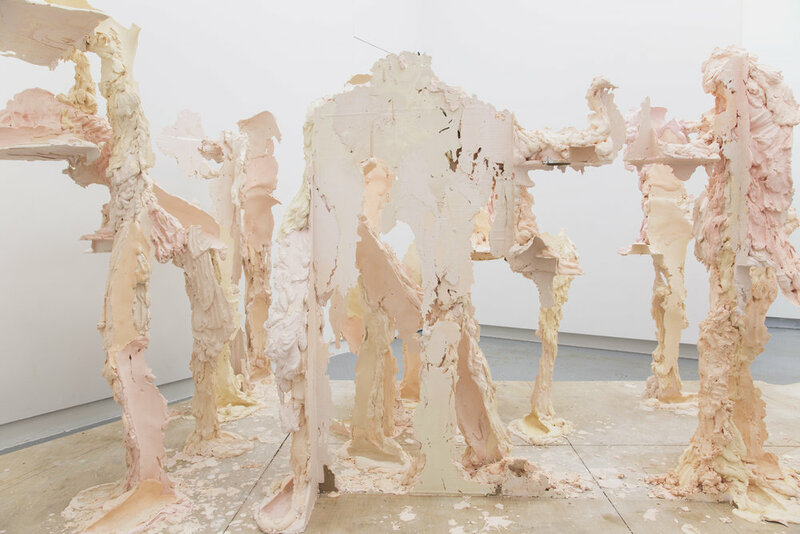 Like a gigantic slug or corrosive process, I maneuvered my body through the negative spaces available between the life supporting fixtures inside the habitat, leaving a trail of plaster as I went along. 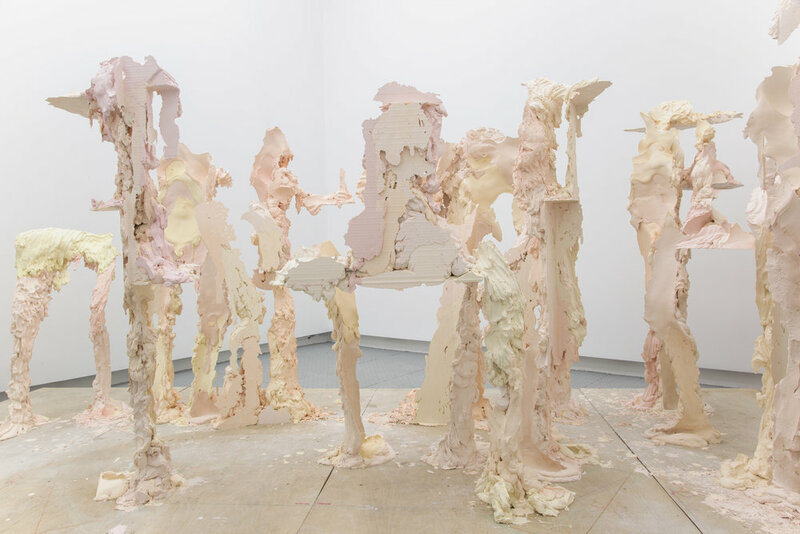 The plaster held the impressions of interactions between my body and the surfaces on which it rested or leaned. The plaster was tinted in colors ranging from oxide orange, yellow and red, producing a warm tactile map, a visible trail of what I’d touched and a record of movements that were possible between the habitat’s functional forms. Once an area of the structure was cast this way its paper and wood form was disassembled, exposing the plaster, which hovered ghostly like a fossil - a tactile artifact of the long-gone architecture and missing body.